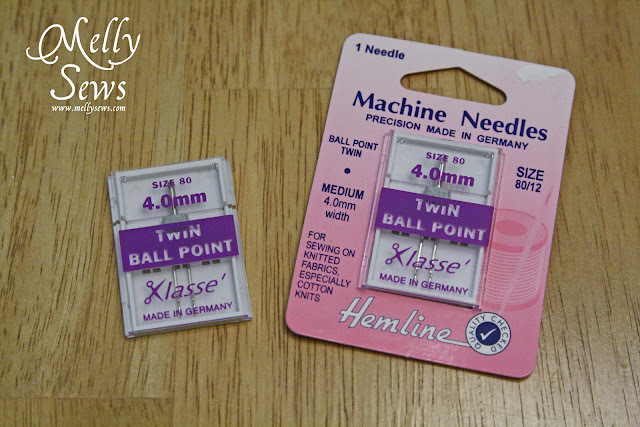 I use my twin needles on my regular sewing machine mostly for hemming stretch fabrics, and therefore I prefer Klasse’ Twin Ballpoint Needles Size 80 – 4.0mm . The universal twin needles they sell at Joann sometimes work and sometimes don’t – like when I was sewing my tankini. 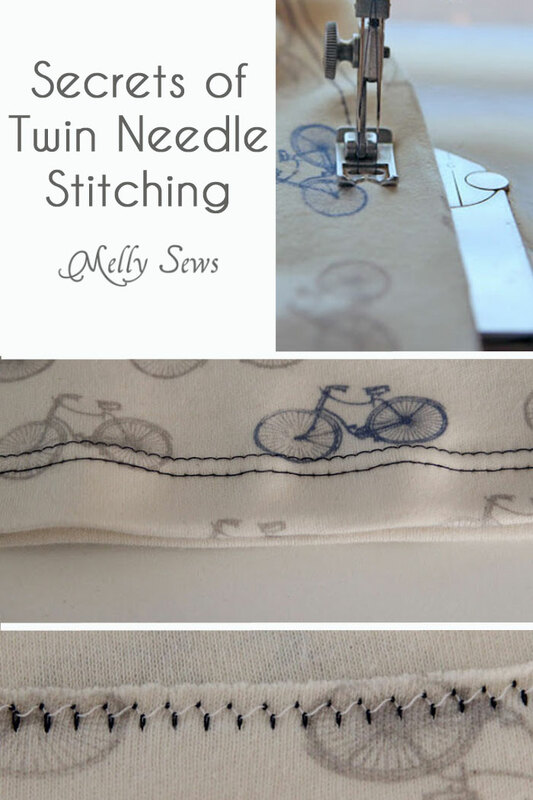 I read several blog entries about using twin needles that were pretty helpful when I first started using these, but there were several things I had to discover on my own. So this is a summary of my best tips for sewing with twin needles. Buy ballpoint needles if you’re going anywhere near knits for this. Pay attention to the width (the mm number; 4mm in the picture above). Some extra wide-set needles won’t fit with the standard foot on vintage machines. I learned this the hard way. Give your stitching a tug every 6 inches or so if you’re doing a long hem to prevent puckering. First, replace your needle with a twin needle. 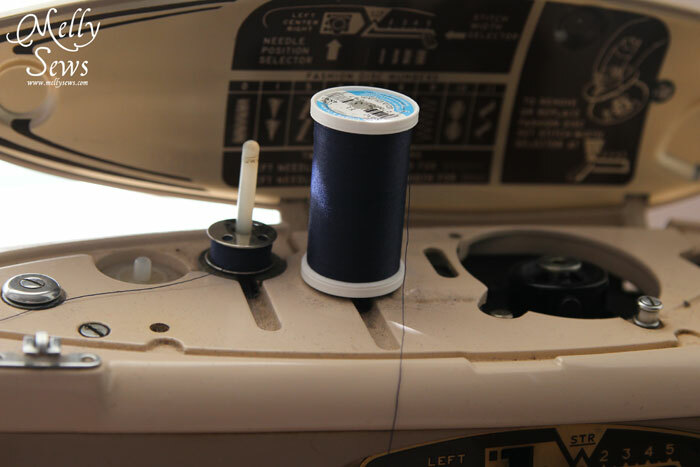 Then put the thread and a bobbin of the same thread on your machine. Make sure thread is unwinding the same direction off both. Here are two configurations of what that might look like (please excuse the mismatched thread in the first picture). 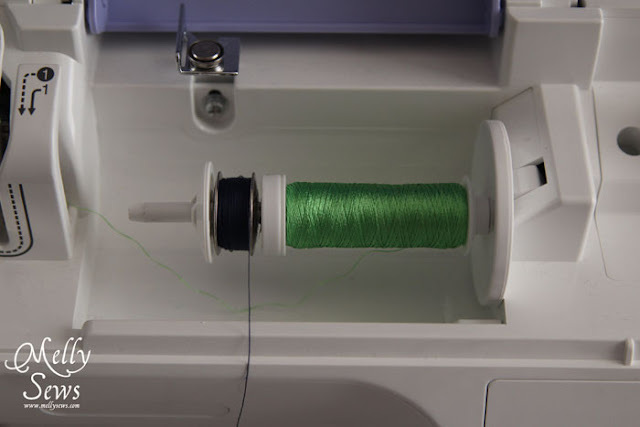 Holding the two threads together, thread the machine as if you were only using one thread until you get to the needles, then separate the threads. Tug one to see if the left or right thread unwinds, then thread the corresponding needle. Iron your hem. If you HAVE to, pin it. But you don’t want to sew over the pins. Two needles = 2 x the chance you will hit a needle. Sew with the top side of the hem up. I use my finger on the left hand to feel the seam as I feed the fabric. Remember to leave LOOOOONG tails before you start stitching. Stitch around to where you started. 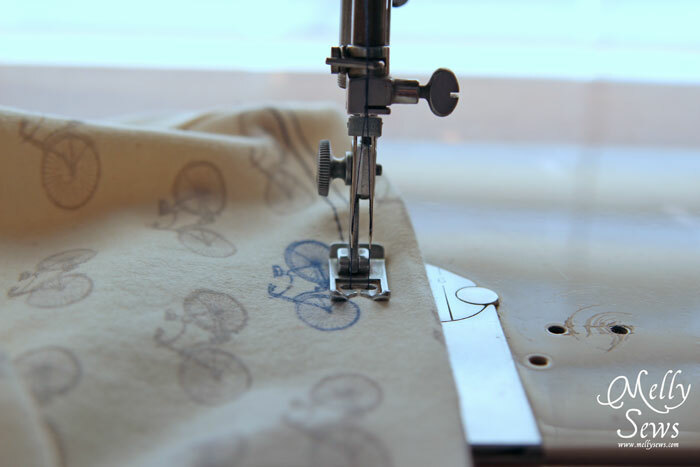 Don’t backstitch or overlap your stitches. Leave long tails again before cutting. Give your hem a good tug. 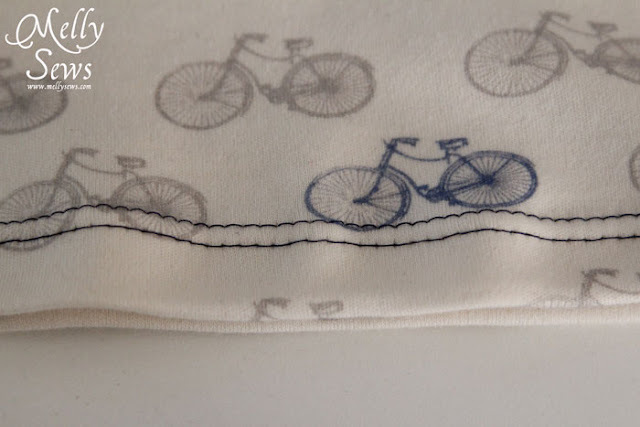 You’ll notice that the bobbin thread tails in particular may get a lot shorter. 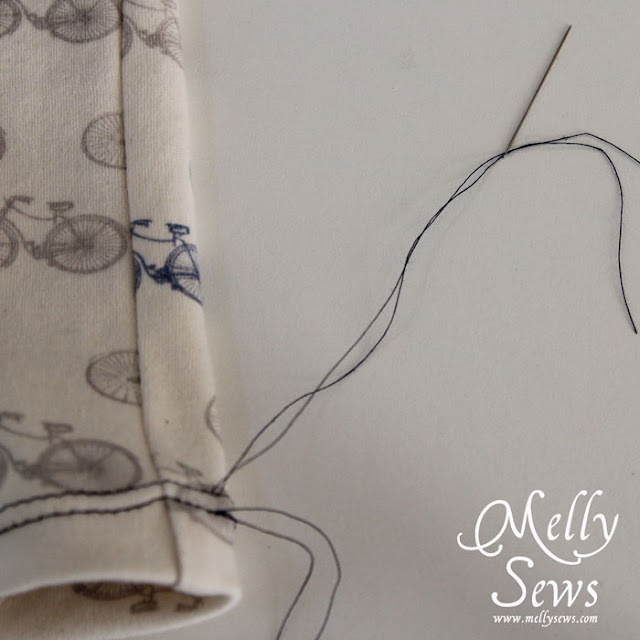 Thread your long tails through a needle, two at a time. Use the needle to pull the threads to the wrong side. Knot all the threads on the wrong side before cutting. And like this on the back. 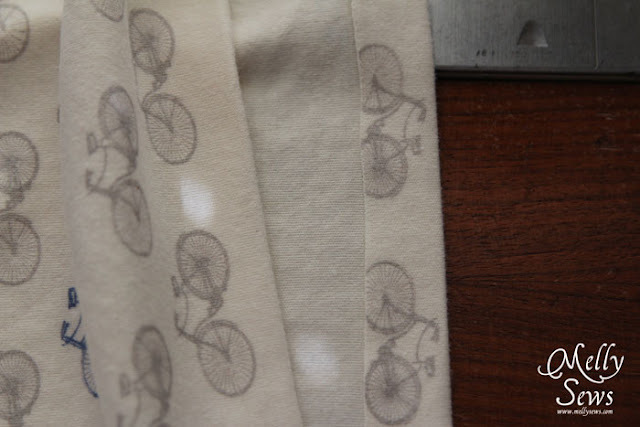 That zig-zagging of the bobbin thread is what gives the hem its stretch. Thank you for showing this. It’ll be very helpful for me. I like to sew knits but have things to learn and haven’t use double needle yet. Thanks for sharing this, Melissa. I’ve never used double needles, but I’ve always wanted to try. I think I’m think I’m ready to after reading this! WOW, this is so helpful! Thanks, Melissa! Thank you Melissa! This was SUPER helpful! Wow this is super helpful!!! I sewed up a dress for my daughter using knit fabric and had to hem the bottom of three rows of ruffles. I did a rolled hem and wow if I had read this tutorial in time I would have saved myself a lot of headache!! Thanks again! Can’t wait to try this on my next knit project! This is great. Just about to start twin needling my knit hem and have all the info I need. Thank you! I tried this approach tonight before finding your post. It was really close to what I was hoping would happen, but not quite. I felt like the bobbin thread needed less tension so it could stretch better, but I didn’t see a way to reduce bobbin tension. Your photo looked the same as the underside of my garment. Any tips for getting that bobbin as “loopy” as possible for max stretch? I went and bought a second bobbin casing and set it super low. It looks great on the back now. This tutorial is SUPER helpful though! Thank you! 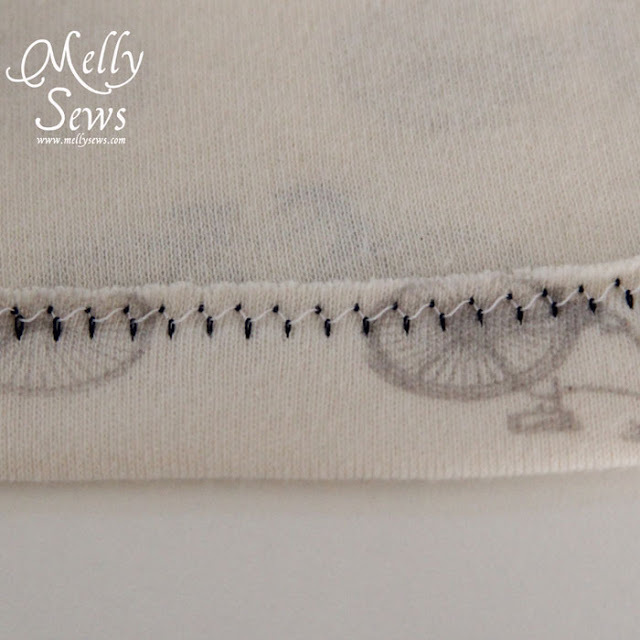 Thanks for this tips… I’m tying just now, the only problem is that when I pull the twin needle down it doesn’t want to get the bobbin thread…. I already wasted lots of thread and this is giving me headhache… Any suggestion? This is my go to blog post when I am helping someone figure this out. Thanks for being such a helpful gal!!! Very, very helpful. Easy to follow explanations. 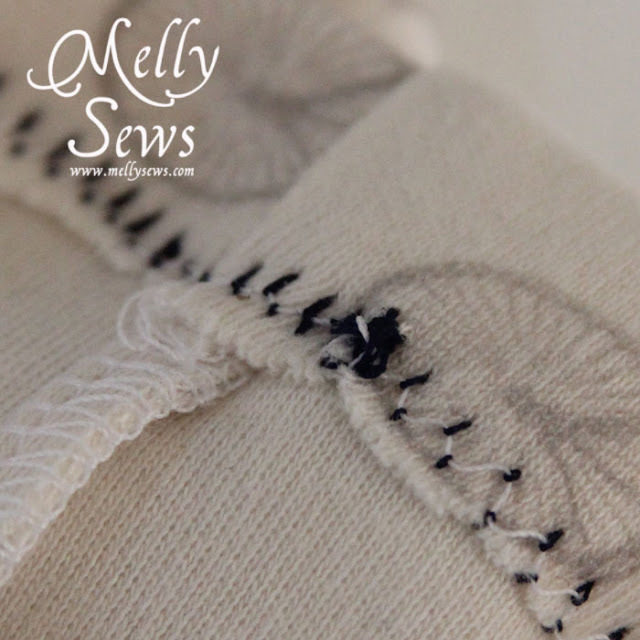 Thank you so much for posting your tips, Melly especially about the Klasse needles and leaving long tails. This is exactly the information I needed, thanks! Thanks for this. Another tip that saved me so much headache is to use the walking foot with the twin needle for very stretchy, slippery fabrics. Make.sure the needle is narrow enough first.